PanARMENIAN.Net - PAN is presenting the most important sports events of the last year. For the first time in the history of independent Armenia, the country was represented at Rio Olympic Games by 33 athletes in 8 competitive sports, winning 4 medals. After a 20-year break, Greco-Roman wrestler Artur Aleksanyan seized gold. Wrestler Mihran Harutyunyan didn’t get a gold medal due to a biased attitude of the judges and became a vice-champion. Weight lifters Simon Martirosyan and Gor Minasyan also won silver medals. Harutyunyan lost the final bout to Serbia’s Davor Stefanek. The judgment was rated as extremely unfair, taking into account the fact that the President of the International Wrestling Federation, Nenad Lalovi, is an ethnic Serb. Coaches pinned hopes on European champion Harutyun Merdinyan (pommel horse) and European vice champion Artur Davtyan (vaulting). During the qualification round, Merdinyan gained 15,583 points, taking the 4th spot and getting to the finals. However, his final performance was not a success and he finished 7th. Davtyan’s first vault was perfect but the second proved to be a failure. As a result, he qualified 11th and dropped out of the further competition. At Paralympic Games, Armenia was represented by 2 participants: weightlifter Greta Vardanyan (Gyumri), who took the 5th place, and swimmer Margarita Hovakimyan (Yerevan), who finished the 13th. Following the 2016 Rio Olympic Games, four elements were named for the gymnasts who successfully completed them in competition. Two elements came on the men's side, two on the women's, one of whom is Armenia’s Houry Gebeshian. Her original element on the uneven bars was officially approved by the International Gymnastics Federation (FIG) for further publication in the respective Code of Points. The element describes as a hecht mount with a 360 degree turn, repulsing off the lower to the higher bar. Men’s gymnastics comprises six events: floor exercise, pommel horse, still rings, vault, parallel bars, and horizontal bar. Armenian athletes performed brilliantly in three of these events at 2016 European Gymnastics Championships. Harutyun Merdinyan became European champion for his performance on pommel horse, while Artur Davtyan (vaulting) and Vahagn Davtyan (still rings) won silver medals. Artur Avetisyan became still rings vice champion in the Junior Championship. Later, PanARMENIAN.Net talked to the athletes and their coaches, and PAN Photo took pictures of the poorly-equipped gym, where the guys are training. Armenian weightlifters showed their best result in history at the European championships, getting on the podium with 8 gold, 7 silver and 3 bronze medals. Turkey came second, while Ukraine was the third. Andranik Karapetyan and Tigran Martirosyan were named European champion and vice-champion respectively; Gor Minasyan seized two silver medals; Vanik Avetisyan and Simon Martirosyan got bronze. Armenian female weightlifters won the team event with 449 points, with Hripsime Khurshudyan and Nazik Avdalyan winning the champion title. Sona Poghosyan finished 4th, while Kristine Petrosyan, Arpine Dalalyan, Anna Govelyan and Izabella Yaylyan took the 5th, 6th, 9th and 10th spots respectively. Sona Poghosyan became junior vice champion, while Samvel Gasparyan won a bronze medal. Besides, some of the Armenian junior team members won medals in a number of competitions. On October 14, Armenian national football team coach Varuzhan Sukiasyan submitted his resignation to the Football Federation. On October 19, it became known that former player Artur Petrosyan will assume the vacant position. A former member of the national team, Petrosyan was the manager of Swiss FC Zurich. Experts say that being a representative of Armenian football, Petrosyan is acquainted with the peculiarities of European style of playing. The Armenian team suffered 4 consecutive defeats in 2018 World Cup qualifiers against Czech Republic, Denmark, Romania and Poland, scoring only one goal to the last-named and conceding 11 goals. However, the team the very first match under the management of Petrosyan. In the 4th tour of 2018 World Cup qualifiers, Armenia celebrated a victory over the group leader, Montenegro. Armenian national team midfielder Henrikh Mkhitaryan left Borussia Dortmund to join Manchster United. The 27-year-old signed a four-year deal with the option of a fifth, costing Manchster United €42 million. His annual salary will make €12.5 million. "I am very proud to join Manchester United. This move is a dream come true for me. I am excited to play for a club with such an illustrious history and hope to be part of it for a long time. I thank the trust the club and Jose Mourinho have put in me,” the Armenian said. Mkhitaryan made his debut in a 2–0 victory in a pre-season match against Wigan Athletic on July 15, 2016. On August 7, he made his competitive debut as a stoppage-time substitute in a 2–1 victory against Leicester City in the 2016 FA Community Shield. He became the first Armenian to play in the Premier League on August 14, when he came on as a 75th-minute substitute for Juan Mata in a 3–1 away victory against Bournemouth. He made his first Premier League start for Manchester United in the Manchester derby on September 10, but he was substituted at half-time. On December 8, Mkhitaryan scored his first goal for the club, away against Zorya Luhansk, in Manchester United's last group match of the Europa League. 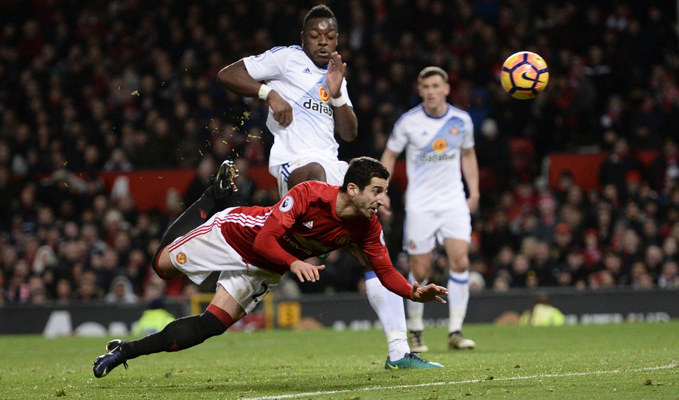 Three days later, in United's next game, Mkhitaryan scored his first Premier League goal in a 1–0 victory over Tottenham Hotspur; however, he left the game in the second half after suffering an ankle injury. He returned two matches later, coming off the bench to score United's third goal against Sunderland, a scorpion kick which he described as the best goal he ever scored. UK football magazine FourFourTwo included Mkhitaryan in the list of Best 100 Football Players in the World. Besides, the Armenian star improved his position in The Guardian’s top 100 players, rocketing to the 57th spot from 77th. On December 21, Mkhitaryan was recognized as the best football player of the year. In July, Armenian basketball team showed a good game at European Basketball Championship for small countries, after which it was decided to form the first ever professional BC Urartu to take part in further competitions. However, the first appearance of club during the Russian Super League 1 games was extremely unsuccessful: Armenia suffered 9 consecutive defeats in 9 tours. It was decided that the club, consisting mostly of national team players, will not drop out of the competition. Nevertheless, Armenia will be represented by 5 age-groups at the 2017 FIBA European Basketball Championships. Weightlifter Tigran Martirosyan was disqualified as well: he lost the bronze medal for the Beijing 2008 Olympics after testing positive for dehydrochlormethyltestosterone and stanozolol. Armenian chess players won two gold medals at the European Youth Chess Championship in Prague, the Czech Republic. Mamikon Gharibyan won gold in Boys under 12 (B12) category, scoring eight points out of possible nine. Meanwhile, Manuel Petrosyan won the B18 category with 7.5 points. Rufolf Pashikyany finished 7th in the youth competition under 8. Aram Hakobyan (under 16) took the 3rd-5th spots with 7 points, while Hayk Martirosyan (under 18) shared the 2nd-5th spots. Arsen Davtyan (under 10) and Shant Sargsyan (under 14) were also on the top 10 list. Mher Mkrtchyan was the first athlete to represent Armenia at 2016 UEC European Track Championships held in France from October 19 to 23. He got some points at the beginning of the track but failed to succeed and finished the race, winning no medal.